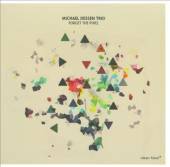 A trombonist with strong roots in the acoustic tradition and a fondness for cutting edge electronic experimentation, Michael Dessen straddles the line between the avant-garde and the accessible better than most. A dauntless sonic explorer, Dessen has bolstered his extensive academic career studying with icons like Anthony Davis, Yusef Lateef and George Lewis. In addition to numerous projects involving solo trombone performances augmented by live electronics, Dessen is a member of the West Coast quartet Cosmologic, whose recent album, Eyes in the Back of My Head (Cuneiform, 2008), documents a longstanding collective at the top of their game. Between Shadow and Space is the premiere of Dessen's trio with bassist Christopher Tordini and drummer Tyshawn Soreyand his first recording to prominently feature his computer programming skills. 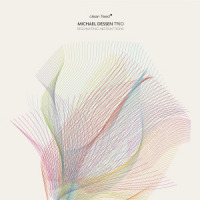 Dessen's debut as a leader, Lineal (Circumvention, 2007), found him joined by such heavyweights as Vijay Iyer, Mark Dresser and Susie Ibarra, eschewing electronics in favor of an acoustic environment. 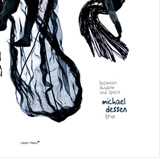 Dessen's diverse approach towards composition encapsulates a range of moods and textures on Between Shadow and Space, veering from the nervy dialog of "Duo Improvisation" to the ambient introspection of "Granulorum," an electro-acoustic tone poem of almost ritualistic severity. An expressive and virtuosic soloist with a bright, brassy timbre, Dessen regularly enhances his cleanly articulated phrases with laptop generated EFX, expanding the trio's sound palette. Inspired by fellow artists, Dessen coined the name of the episodic title track from Pablo Neruda's poem "Ars Poetica," while the dynamic excursion "Chocolate Geometry (for MSD)" was inspired by the abstract paintings of Mariangeles Soto-Diaz. The latter tune provides a riot of unpredictable sonorities, with a phantasmagoric electronic interlude bookended by plangent acoustic variations. Dessen's sidemen offer stalwart support throughout. Tordini's resolute bass pulse on "Restless Years" is steadfast, refusing to yield to Sorey's blistering waves of polyrhythmic fury. The leader coaxes long, muted tones and sputtering, digitally enhanced cadences over Tordini and Sorey's interlocking counter-rhythms, adding rich expressivity to a mesmerizing sonic collage. A brilliant example of long form development, Tordini opens "Anthesis" unaccompanied, with a patient, sinuous bass solo full of understated melodic variations before Sorey casually enters with a progressively intensifying attack. Dessen joins the escalating fray as the trio launches into a series of pulverizing, yet lyrically robust rhythmic contours. Dessen reveals his finest integration of computer EFX with acoustic instrumentation on the gentle "Water Seeks," a shimmering mosaic of kaleidoscopic radiance spun in honor of the late Alice Coltrane. Incorporating a range of dynamics that veer from pneumatic funk to pointillist discourse, Between Shadow and Space is a compelling set that reveals additional layers with each listen. Track Listing: Between Shadow and Space; Chocolate Geometry (for MSD); Restless Years; Duo Improvisation; Anthesis; Granulorum; Water Seeks (for AC). 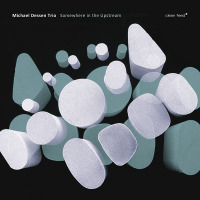 Personnel: Michael Dessen: trombone, computer; Christopher Tordini: bass; Tyshawn Sorey: percussion.